Frenchman is also still planning to run for FIFA presidency in February. MICHEL PLATINI HAS called FIFA’s eight-year ban a “kick in the teeth” but has vowed to fight on for the presidency of world football’s governing body. The FIFA vice president and UEFA leader condemned the ethics committee that banned him on Monday but said he would “fight to clear my name”. Platini’s ban from all football activities prevents him from standing in the 26 February election to find a replacement for FIFA president Sepp Blatter and working as UEFA president. Blatter and Platini were suspended for eight years over a 2 million Swiss franc (€1.8m) payment made to Platini in 2011 for work between 1999 and 2002. 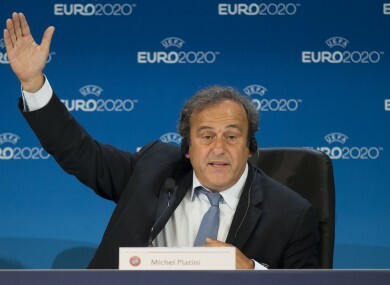 But Platini is determined to plough on in his quest to become the most powerful man in football. “I will fight. But then I’ll take my responsibilities according to what happens,” he said. However, Platini acknowledges that he may run out of time if the issue is not resolved quickly in his favour. Platini insisted there was nothing illegal in the oral contract he said was agreed with Blatter. The salary agreement was, however, never disclosed in FIFA documentation until the payment was made in 2011. “I’m struggling to understand. Why? How did we get to this? I did some work, I asked to be paid, I sent an invoice, I was paid, I paid my taxes on that. That was in 2011,” he said. “There was a debt that was settled, full stop! Then, in 2015, the Swiss court wanted more information. “Then it took off at FIFA and a lot of people at FIFA are happy that this issue happened. Platini repeated his suspicions that the timing of the ban was a deliberate attempt to prevent him from standing in February’s election. “What was the FIFA ethics committee doing between 2011 when I was paid and 2015? Was it sleeping? Suddenly it wakes up,” he scoffed. “I’m fighting against this injustice, from one court to another,” said Platini, referring to the various avenues of appeal he can take within FIFA, to the CAS and even in the Swiss civil court. “But there you go, in the meantime, my name has been dragged through the mud in the press. Meanwhile, a source close to FIFA claims Blatter must give up his presidential apartment by February 26, once his successor has been elected. The apartment in an old Zurich house that has been divided is one of the perks Blatter will lose due to his eight-year suspension. “He is still protected by his labour contract” under Swiss law, said the source. So Blatter will continue to receive his salary — for which he has refused to reveal the amount — as well as keep his FIFA car and apartment until the contract ends on February 26. Email “'I will fight to clear my name' - banned Platini disgusted with decision”. Feedback on “'I will fight to clear my name' - banned Platini disgusted with decision”.